Well I have survived my flu and am starting to come right. Thank you for your well wishes and prayers, they were most appreciated. 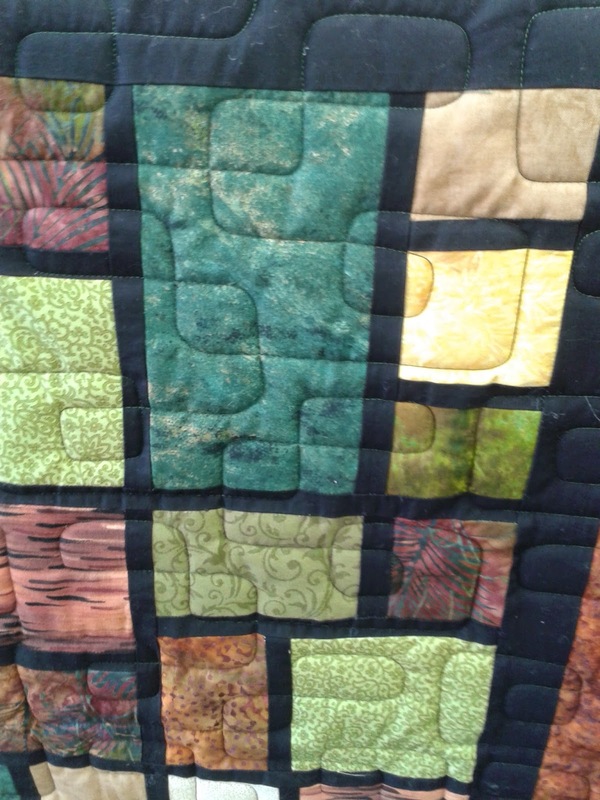 I plodded away at the Pretties Scrap quilt, some days unpicking as much as I stitched, but I won in the end. The top is now half way together and it does look gorgeous still. 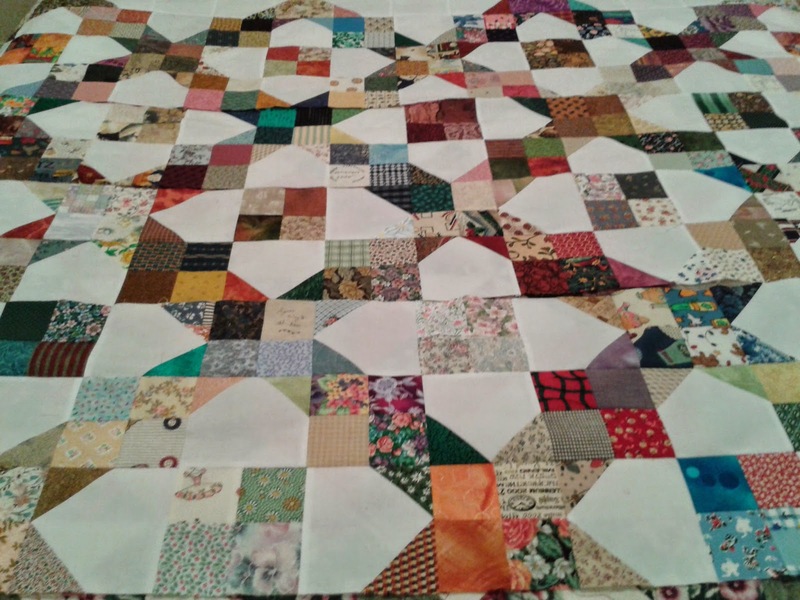 I am already thinking about quilting designs. I have been very strong with myself and just put my hand in each bag of Block A or Block B without looking. It surprises me how good it has come out doing this. Plodded away over the last couple of days and basted and removed the applique quilt as my eyes couldn't handle the black yet. 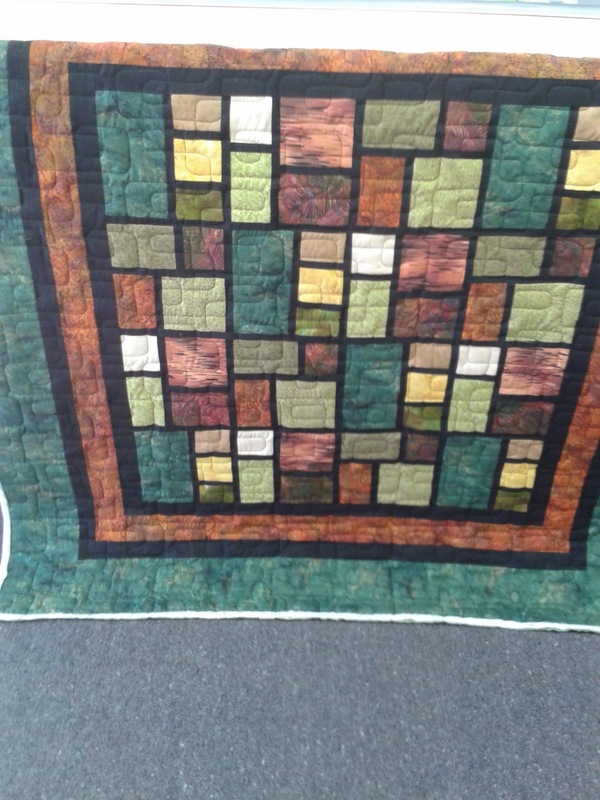 Popped on this very modern looking lap quilt that is being sent off to Australia for Jude's son in law. It has come up really nice. I used a pattern I have had for a while but not used called "Cool Beans" but I have forgotten the designer. Will let you know next blog. The thread is Superior's Magnifico in a gorgeous dark jade green. It stands out nicely and gives good texture. 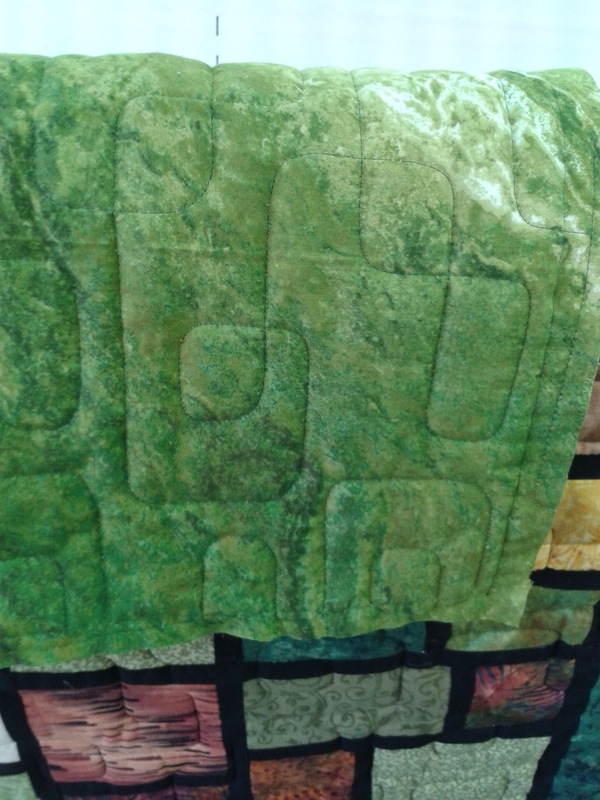 On the back is a lovely green fabric that is much more apple/limey green not the jade colour that this photo shows. and last but not least...please hold this up for me dear hubby!! I need an outside shot and the ground is wet. Happy to have got something done. Weather is extremely chilly but we are much better off than a lot of the country which is getting a good snowing. The fire is roaring so we are real cosy. Catch you again soon. Thank you for coming by. 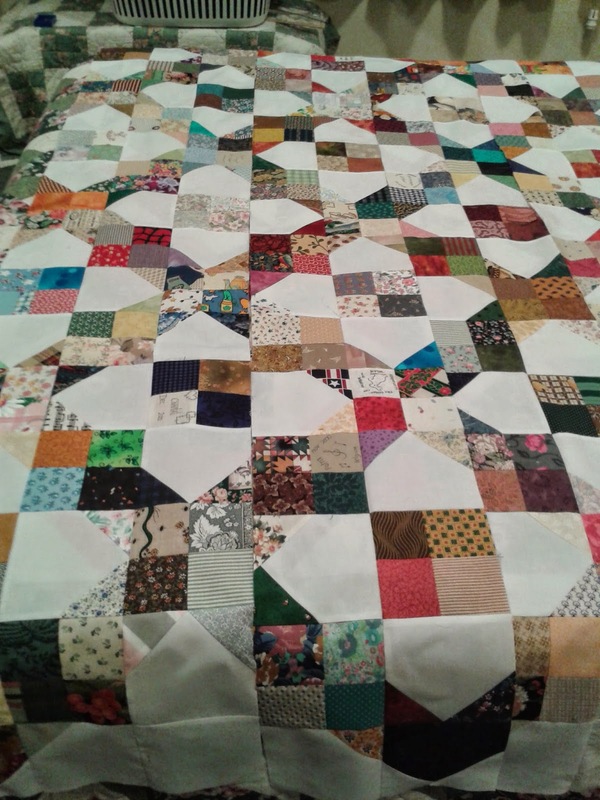 Both quilts are gorgeous, Clare. So glad you are feeling better. 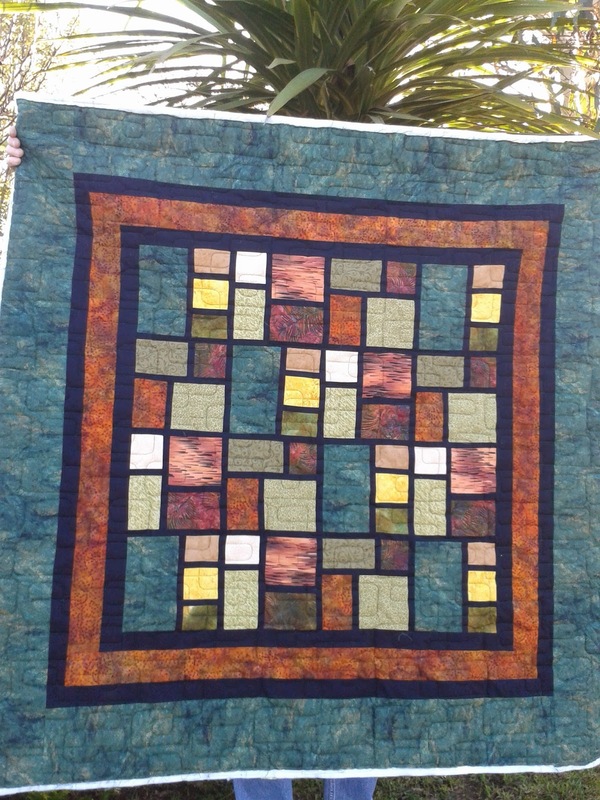 Love that pattern you used on the stained glass quilt. He's going to really like it. Stay warm.